As the temperature starts to drop and the leaves begin to fall, the entry into the early stages of winter is accompanied by the closure of fall season sports. With this bittersweet ending, over the past few weeks, all athletes were given the chance to demonstrate the athletic skills they cultivated throughout their harsh afterschool training sessions. 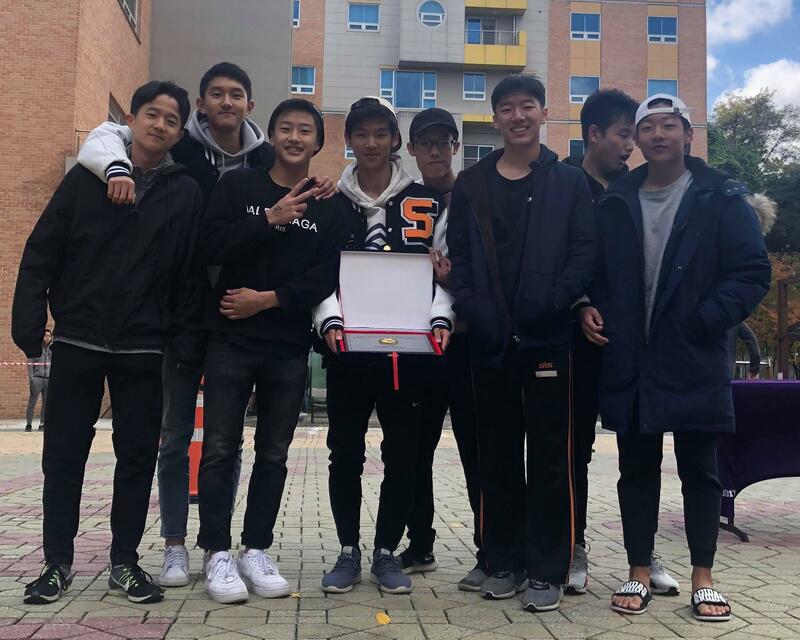 All members of the cross country team, the volleyball team, and the tennis team were able to make considerable achievements in the KAIAC tournaments that were held amongst all divisional international schools in Korea. The cross country runners displayed great improvement from last year, perhaps due to the runners’ continuous practice during off-season. Although the girls were sadly unable to place in KAIAC, the boys were able to obtain the overall 3rd place award; the best that the cross country boys team had done was 4th in KAIAC. A few individuals also received patches, including one that celebrated their performance throughout the entire season (all-conference) and another that commended their performance at the KAIAC race (all-tournament). Among the boys, Andrea Shin (11) received both patches, while David Lim (10) received the all-tournament patch and Thomas Song (10) received the all-conference patch. Among the girls, Katherine Kim (12) received the all-tournament patch. The volleyball team fought long and hard during their two-day KAIAC tournament. The girls’ team, which took a trip to Dwight School Seoul for the tournament, placed 4th in conference, and the boys’ team, which had a home tournament at SIS, placed 6th. Among the girls, Sunhee Bae (12) and Yewon Chu (11) received all conference patches and Hannah Kim (12) received the all tournament patch, and among the boys Richie Kim (11) received the all conference patch and Sean Lee (12) received the all tournament patch. In addition, the boys’ team received a sportsmanship award for being the most coherent, organized, and sportsmanlike team. The tennis team also had a very successful day, though filled with many delays and idle hours, at SFS. The girls’ team was quite exceptional, earning 2nd place among all teams, while the boys’ team placed 5th. Among the boys, Phillip Yoo (9) won the all conference patch and among the girls, Kristina Hyunseo Kim (11) and Amy Yunseo Kim (11) won the all conference patches. In addition, due to their good manners and attitude during the matches, both the boys’ and girls’ teams were also awarded the sportsmanship award. The athletes of SIS provided a healthy ending to the fall season by displaying their increased athletic abilities during the KAIAC tournaments, all the while maintaining good sportsmanship. The end of the season indicates an end to the daily pain that complements practices, a great time with teammates, and the last practices and games with the leaving seniors. Nevertheless, all athletes did very well in managing the stress of balancing sports and academics, and it will hopefully be the same for following seasons as well. Thomas Song is a sophomore and a reporter for Tiger Times. He has great aspirations to make meaningful contributions to the school newspaper. During his free time, he enjoys to play sports, binge-watch TV shows, and eat snacks.